Mommie finally got around to applying my iron-on picture to a shirt this weekend! But the shirt is a tad too big for me so I told Mommie she could wear it. Thanks Miss Betty and Lexi for making the iron-on for me. It is cool to see my picture on a t-shirt. And I love the color blue! I got to sleep on Uncle's space age pillow. It looks like it is from outer space. It is all silver and shiny. I had to be careful though coz I kept slipping off of it. My first few attempts at sleeping on it ended up with me lying on the floor. So Mommie propped it up against the sofa so I would not slide off. I did real good over the weekend. I only paled up a few times. Mommie has transitioned me back to my doggie food. And my poop is all good and solid. Mommie saw this on ebay. 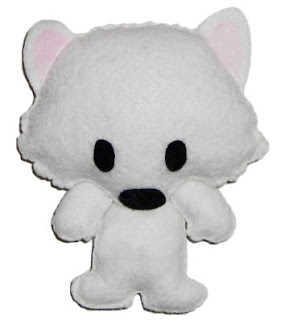 It is a Needle Felt Eskie. Isn't it cool? It looks just like me. We have never heard of needle felting before. Mommie's friend says needle felting is where you take wool- when it is at a stage in the yarn making process called 'roving', and form that roving into whatever you like. The needles come into play because you actually use barbed felting needles to pierce the wool/roving until the fibers stick to one another and a 'fabric' is made. What a neat idea! Check out all these other dog breeds. We also got my latest blood test results. My PCV is at 32. Not yet in the normal range but at least a little bit higher. And platelets at 547k which is a drop but still a good number. Yipee!!! I hope my numbers just keep going up and up. They found a red spot on my leg but it went away in 2 days so goodie. The doctor said we should try reducing my meds coz of all the bad side effects. Mommie is worried about that coz my numbers are not that high. Thanks again all for praying for me and to all who organized, bid, donated and spread the word about my auction. I had a good day today. No spots no bleeding and Mommie said my gums looked pretty good. I hope I hope I hope this means things are turning around. She was being silly and lifting the covers and letting it float down on me. Heeheehee! Mommie you are so silly! Boy, it has been really hot these past couple of days. Mommie has the electric fan directed at me to help cool me down. I have not been able to post much as I have been having problems logging on. Not sure what is wrong here. Even email is misbehaving. We saw lots of our mail going into the Junk folder. Anyway, I am doing ok. So far so good. No new red spots and no new bleeding. Yipee! My gum color comes and goes though. Mommie has gone nuts and is now even more obsessed with checking them than ever before. My meds are making me hungry all the time. I keep asking Mommie for food but she said I had to be on a strict diet coz I am gaining too many pounds. Also my legs are a bit weak so they keep sliding out from under me. My hind legs usually give way when I am walking and turning a corner or when I am standing while I eat. So now I stand on a rug while I eat my meals. The rug helps me keep my feet in one spot. That was a neat idea! Also the rug keeps my bowl from running away from me. Hehe! Since I cannot play, I have been figuring out ways to entertain myself. Apart from watching tv, I have thought of a neat game. I lie on the bed with my legs dangling on the edge. I keep a toy between my paws and when someone sits near me, I let it drop. They immediately pick it up for me and put it back. So I will look at them, look at my toy, let it drop, and look at them. Haha! They always put it back. Also wanted to say thanks to everyone for praying for me and for lighting candles and for the auction. Sorry we have not had time to check out your bloggies.